This post was written by Hatchet reporter Marty Fenn. When Jonquel Jones went down with an injury against Massachusetts, there was a lot of uncertainty as to how the Colonials respond. After all, losing a potential Naismith winner would be a huge blow for any team. While the past few games have been defined by particularly strong guard play, GW’s 62-47 win over the Richmond Spiders on Sunday afternoon showcased the depth of the front court. Sophomore forward Kelli Prange, who has been starting in Jones’ place, poured in 12 of her 15 points in the second half to lead the Colonials, while junior Caira Washington added 13 points and eight rebounds. Hannah Schaible provided the firepower from the backcourt, scoring 12 points and adding six boards. “Nobody can replace [Jones], her presence alone is astonishing,” Prange said. “But I think throughout the season [head] coach [Jonathan Tsipis] has had confidence knowing I can step in whether it’s for JJ or for Caira. Prange and Washington showed off an impressive array of offensive abilities, from Prange stepping out to knock down a three to Washington making an assortment of turnaround and faceup jumpers. The two bigs even created for each other in the paint, including Washington finding a cutting Prange for a huge and-one that was a backbreaker for the Spiders. The Colonials as a team had great distribution with 20 assists for the game, eight of which coming from graduate guard Lauren Chase. Although the Spiders shot a very respectable 42.3 percent from the field while GW shot just 37.1 percent, they managed just 52 field goal attempts in comparison to 70 for the Colonials. The numbers fell in GW’s favor due to a ferocious attack on the offensive glass. Of their 46 total rebounds, the Colonials corralled 24 offensive boards. Prange, junior guard Hannah Schaible, and sophomore guard Brianna Cummings all tacked on six rebounds to go along with the game-high eight from Washington. The Colonials lead by just four at halftime, but started to build a lead in the third quarter. With GW clinging to a 29-25 lead early in the second half, Prange and Schaible each scored four points to spark an 8-0 run, and GW would finish the quarter with a 45-35 lead. Although the Spiders hung around for the first part of the fourth quarter, a 9-0 run would put the game to bed. 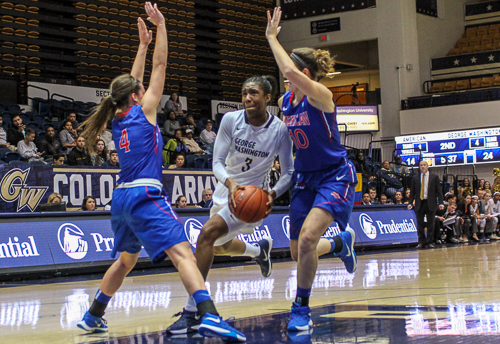 Richmond managed just four free throw attempts for the game, while the Colonials converted eight of their nine tries. The Spiders also had just nine assists and 17 turnovers. Particularly coming off a game in which they allowed the opponent to convert on 54.2 percent of their field goals, a staunch defense was a major lift in giving the Colonials the extra edge. The Colonials have a week off before returning to the Smith Center for a Valentine’s Day showdown against Dayton. The scheduled tip is 12 p.m. EST.